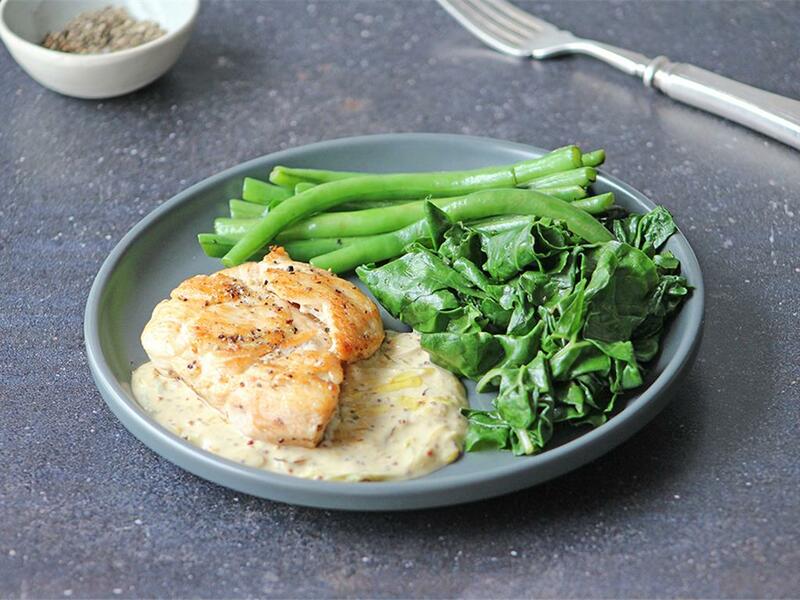 Chicken coated in a warm, creamy mustard cream sauce, served with green beans & Swiss chard. Chicken breasts: Place the chicken breasts between two sheets of cling wrap and bash with a rolling pin (or full wine bottle) to flatten (1½ cm). Season with salt and pepper. Place a pan on medium-high heat with a knob of butter. When hot, add the chicken and fry for 3-4 minutes a side until golden and cooked through. Remove, set aside and keep warm. Greens: Using the same pan on medium-high heat, add the green beans with a splash of water (just enough to cover) and cook for 3-4 minutes until the beans are almost cooked and the water evaporated. Add the Swiss chard and wilt for 1 minute. Season, remove and keep warm. Mustard cream sauce: Using the same pan again (making sure it’s dry) on medium-high heat, add the spring onion with another knob of butter and sauté for 1 minute. Add the mustard, cream and water (120ml for 4; 60ml for 2) and simmer (gently boil) for 1 minute until it thickens to a sauce. Season to taste with salt and pepper, add the chicken back into the pan and coat with the sauce to warm. Serve the creamy mustard chicken with the green beans and Swiss chard on the side. "Plenty food and delicious taste!"